In this blog for ‘Saving Water in your Workplace’ day of Water Saving Week, Gareth Dinnage of environmentally sustainable printer Seacourt calls on the print industry to cut its use of water. Did you know that printing is one of the heaviest users of water in UK manufacturing? Millions of cubic meters of water are used daily by printers, either by extraction from our rivers and lakes, or consumption from our mains supply. Added to this are the harmful chemicals used by water-intensive printing which end up in the system and are costly to remove. Manufacturing as a whole is the largest abstractor of water (around 40% of water from lakes and river) and around 27% of all non-household use of mains water. Water-based printing, which is the large majority of printers, is a significant portion of this and relies on using a mixture of chemicals which add to more harm. First, an explainer on chemicals. Offset printing is the most common form of commercial printing and is also known as “wet” offset. The process uses dampening solution to keep non-printing elements as a hydrophilic on the surface of the printing plate. A part of this is fountain solution, generally composed of water and of 10% isopropyl alcohol (IPA), which decreases the surface tension of water and improves wetting. But IPA has a measurable negative impact both on the environment and health. When used in water solution, as it is in offset printing, IPA partly vaporises to form volatile organic compounds (VOC’s) that pollute the atmosphere and the working environment. Toxic and flammable, IPA, when measured by volume, is the most significant air pollutant in offset printing. As well as the harm it does, its use in complex print operations makes it susceptible to intricate and costly waste water and chemical regulations. However there is another way. This use of water and chemicals such as IPA is no longer necessary because waterless printing is a thoroughly proven, quality process that is used by printers worldwide. At Seacourt we invested in a waterless press when we decided to become a fully sustainable business. Back in 2009 we reduced our water use by 99.5% and had done away with it altogether by 2014, the year we won the UK Water Efficiency Awards. In 2015 we went even further with LightTouch, a technology which uses LED lighting to cure ink to paper, and resulted in our third Queen’s Award. Being waterless is just one element of our operation that makes us sustainable. But water is a critical resource whose depletion or mis-use can do irreversible damage to our environment. Gareth Dinnage is Joint Owner and MD of Seacourt Ltd. Call 01865 770 140 or email GarethDinnage@seacourt.net. Visit www.seacourt.net. Seacourt’s achievements in sustainability have resulted in three Queen’s Awards, in 2007, 2011 and, for LightTouch, in 2016. The firm has had EMAS certification since 1999, and in 2017 was awarded by EMAS ‘Best SME for Environmental Excellence.’ In 2017 ClimateCare certified Seacourt’s environmental impact as Beyond Carbon Neutral. 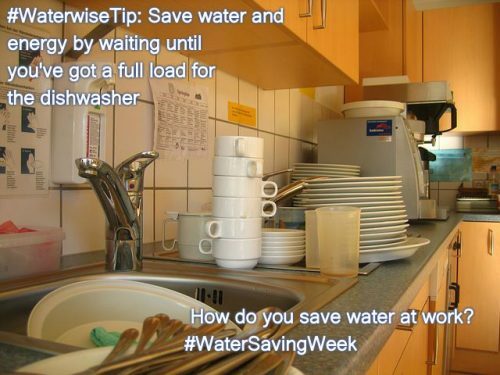 For more water saving tips, go the the Water Saving Week website, or join us on Twitter (@Waterwise, #WaterSavingWeek), where you can also win water saving devices for your workplace.